On the eve of the St. Valentine`s Day I congratulate you with the holiday of lovers! I wish you always to love and be loved, because love is big force that inspires and makes us happy! 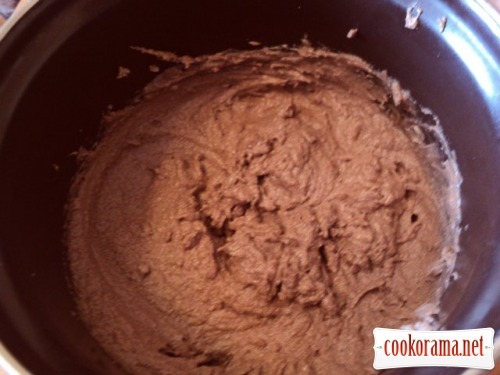 Prepare chocolate butter: melt chocolate in water bath, add softened butter, stir it, add sifted flour and stir to a smooth homogeneous mass. Shift into a container, cover with lid or cling film and place in the freezer for 1 hour till freezing. 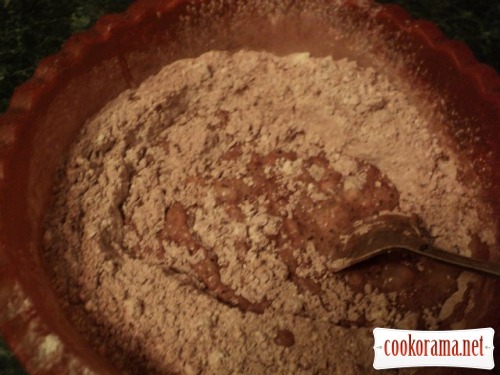 For dough: sift into a bowl 400g of flour (leave 100g for adding ) and cocoa, stir it. Add egg in glass, lightly mix, add salt, lemon juice and pour into the flour mixture. Add another 100g of cold water and quickly knead smooth dough. 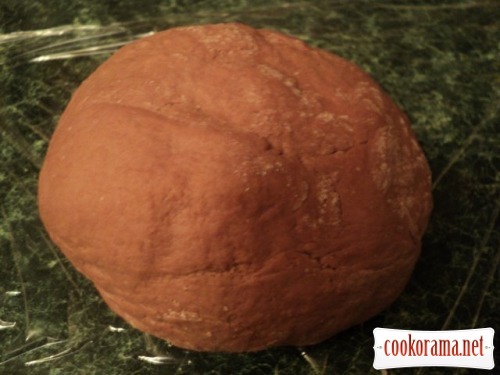 Roll dough in ball, wrap in towel and let it stand for 20 min. 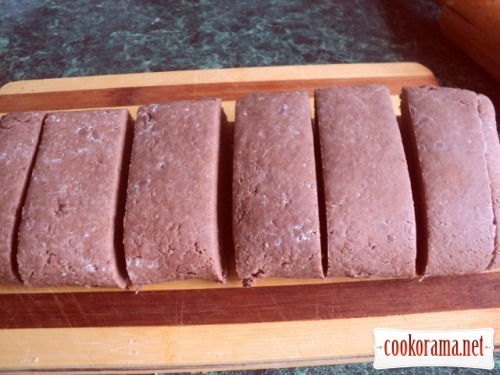 Roll dough in layer, if possible of rectangular shape. Roll edges thinner, than the middle. 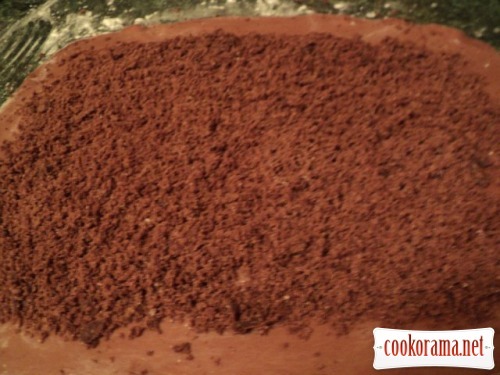 Sprinkle layer with flour, cover with towel and leave for 10 min. 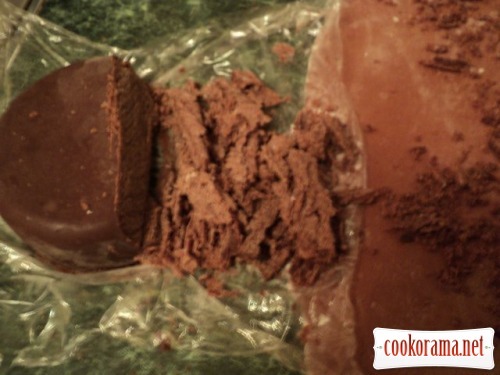 Remove frozen chocolate butter from container, moving knife along the edge. Whittle away thin chocolate chips from butter with knife. Spread uniform layer of chips on layer of dough, departing from the edges on the long side 1.5-2сm, slightly press chips to layer. Wrap the short side of dough layer on top of butter in the middle, pinch the edges. Cover with towel and leave for 10 min. 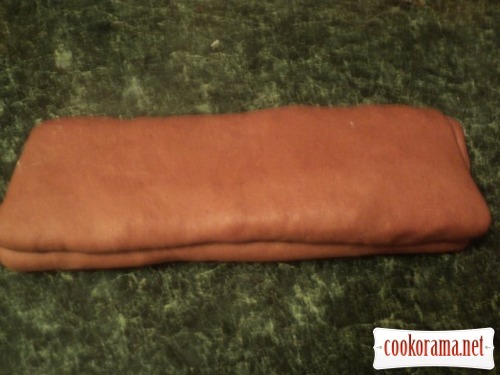 Fold layer again on the short side at ¼ of length and again in the middle. It turns out a bar of 4 layers. Wrap received bar in a towel and put in the fridge for 20 min. 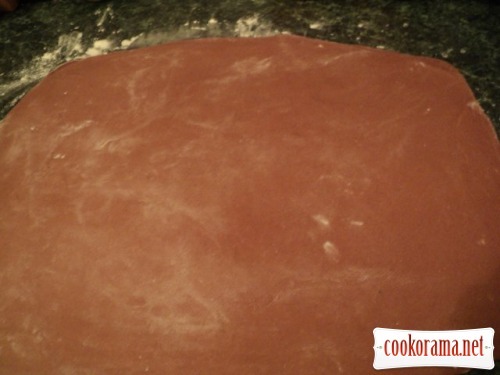 Remove dough and pouring flour, gently roll in layer 1сm thickness. Repeat the procedure of compiling fourfold and once again put dough in the fridge for 20 min. Repeat this process 2 more times. 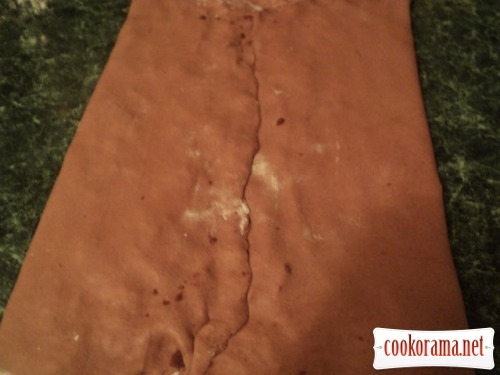 Divide finished dough into 6 parts. 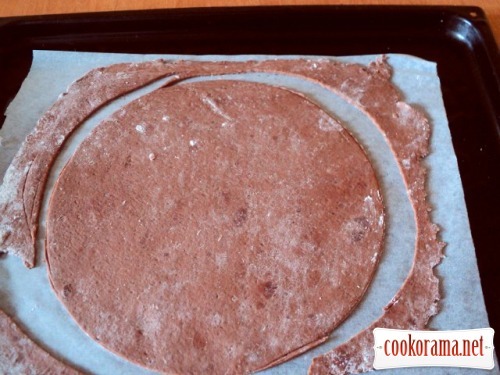 Roll each part thinly, spread on baking paper and cut off circle of desired diameter. I cut due to bottom of split form F-23сm. 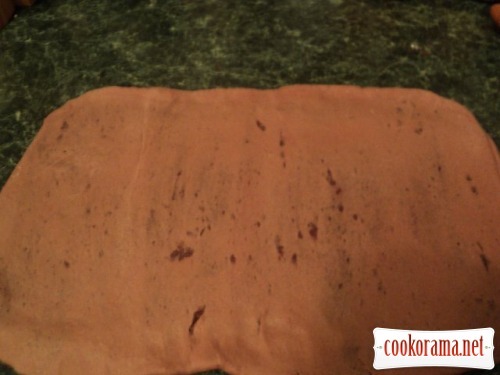 Leave parings on paper, they further will be useful in the preparation of sprinkling. 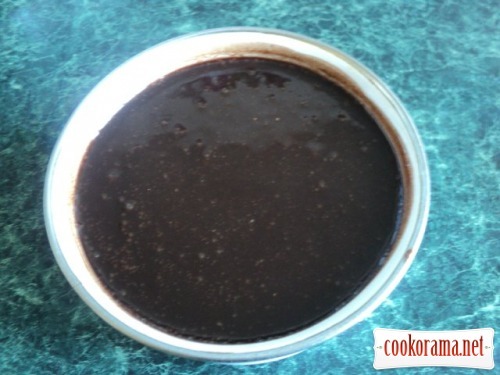 Bake at 200 C for 7-10 min. Bake all 6 flat cakes this way. Prepare custard, mix egg white with sugar and vanilla sugar, add milk, starch, stir over medium heat and bring the mixture to a thickening (do not boil!). 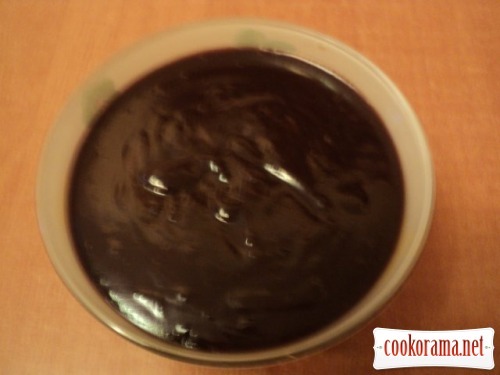 Remove from heat, add broken pieces of chocolate, stir to melt it and get smooth homogeneous mass. Cover container with cling film and cool. 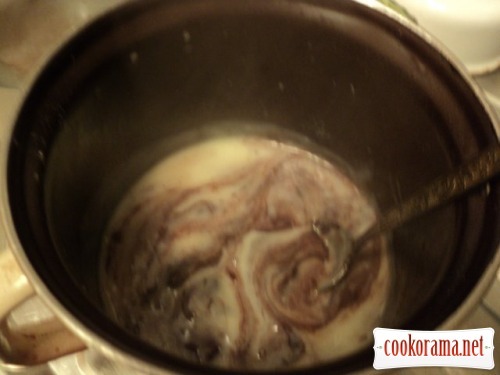 Mix softened butter, gradually adding cooled chocolate cream. 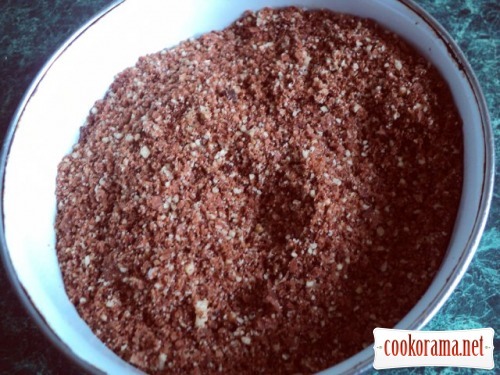 For sprinkling grind in blender parings of flat cakes and walnuts. Optionally you can add cinnamon. Lay flat cakes on each other, smearing with cream. Slightly press flat cakes. 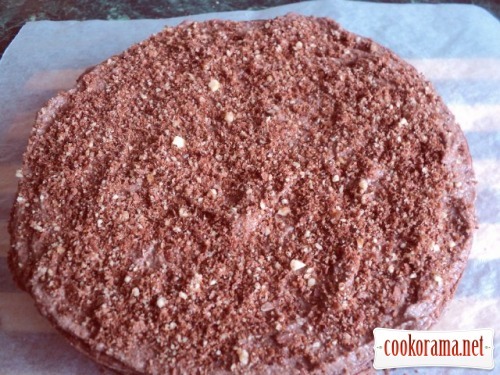 Also smear sides and top of cake with cream and sprinkle with crumbs. Leave the cake overnight. 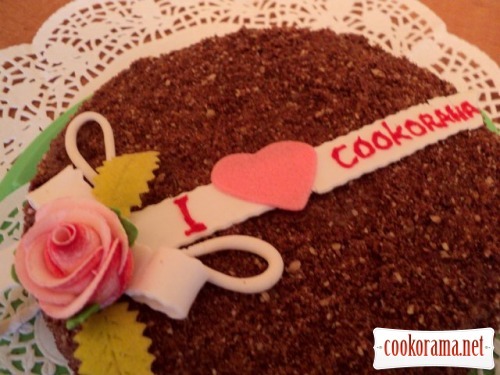 Ready cake can be decorated by flowers from mastic. Bon Appetite! 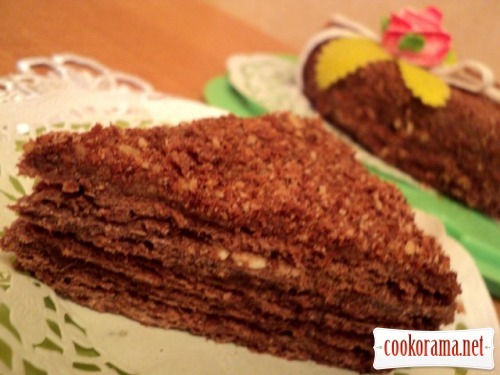 Top of recipe "Chocolate Napoleon"
Дякую, Леся! 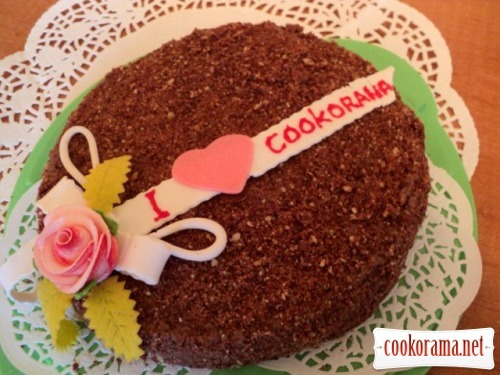 Це подарунок і для тебе, а також для всієї Cookorama! Мила, какой Наполеон! Сколько шоколада!!!!!!!!!!! Не отказалась бы от кусочка, да поболье!!! Спасибо, Ирочка! Шоколада много не бывает! Тортище с большой буквы!!! Супер! Шикиладные торты-это вкуснятина! вкусный торт! великолепный подарок для любителей шоколада! Спасибо, Наташа! Люблю шоколад и торт «Наполеон», а здесь они очень удачно объеденились! И вкусен, и красив! Очччень!!! Спасибо, Лариса! Торт становится еще вкуснее, когда постоит сутки и пропитается кремом! Люда, тортик просто чудо. И красиво оформлен, и вкусен! 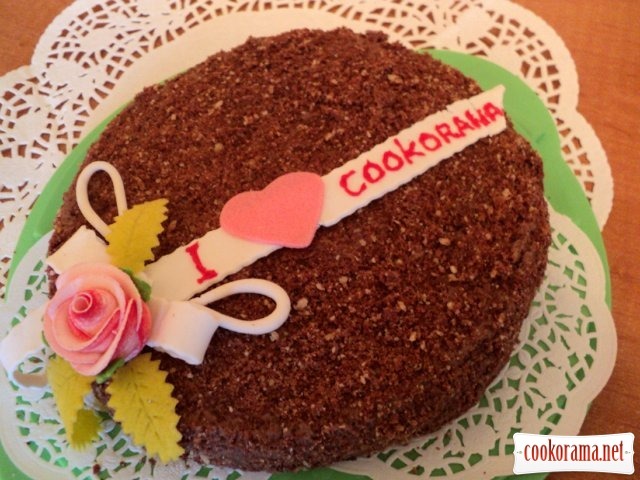 Во первых торт очень красивый и надпись «I love cookorama» на нем смотрится довольно органично. Процесс приготовления детально расписан и проилюстрирован пошаговыми фотографиями. Привязка к сложности и времени приготовления указана. Вобщем мне нравится ! И некоторые пошаговые фото смазанные получились, но это я уже придираюсь . Спасибо за отзыв! По ингредиентам отредактировала( действительно опечатка). За фото извиняюсь, я еще совсем не профи по фото, только учусь! Не скромничайте — Вы профи !